BaconFest YEG returns on September 2, 2018 so you can have a truly delicious long weekend. This event is like a Taste of Edmonton… where you purchase tickets to sample food from various local restaurants, with the key difference being that all the food is bacon-focused! The 2018 BaconFest YEG features 12 Edmonton restaurants dishing out some unique (and sure to be delicious) bacon-themed dishes. There’s bacon, music, comedy, and more bacon! I’ve gone in past years and have always enjoyed eating allllll the bacon! This year, organizers of BaconFest YEG asked if I’d partner with them to help preview the event, and give away three pairs of tickets across my three main social networks—Facebook, Twitter, and Instagram! As a total carnivore and bacon lover, I was happy to oblige. Scroll down for more BaconFest YEG details + enter to win a pair of admission tickets! Yes that’s a Bacon Suit. lol BaconFest YEG returns Sept. 2, 2018! You need to grab an admission ticket ($15/adult in advance, $20/adult at the door, plus lower rates for youth/seniors) to get in, and then buy food tickets to sample all the bacon!! Buy tickets to BaconFest YEG! The amazing candied jalapeño bacon, with pulled pork on cornbread, from River City Revival House! Try this at BaconFest YEG 2018. As part of my BaconFest YEG preview, I got to sample two of the bacon dishes that will be served up on Sept 2—the amazing candied jalapeño bacon with pulled pork on cornbread from Chef Felicia Winston of River City Revival House, and the tasty peameal bacon slider with maple bacon mustard from Chefs Matt Phillips and Andrew Cowan of Northern Chicken! This was my first time at the River City Revival House, which just opened in May in the historic old Citadel building as part of The Starlite Room. It’s the lower hall (basement) of the building, and the menu looked SO fun! (Run D.M.Caesar, Rage Against The Poutine, Sweet Home Yamabama… gold). 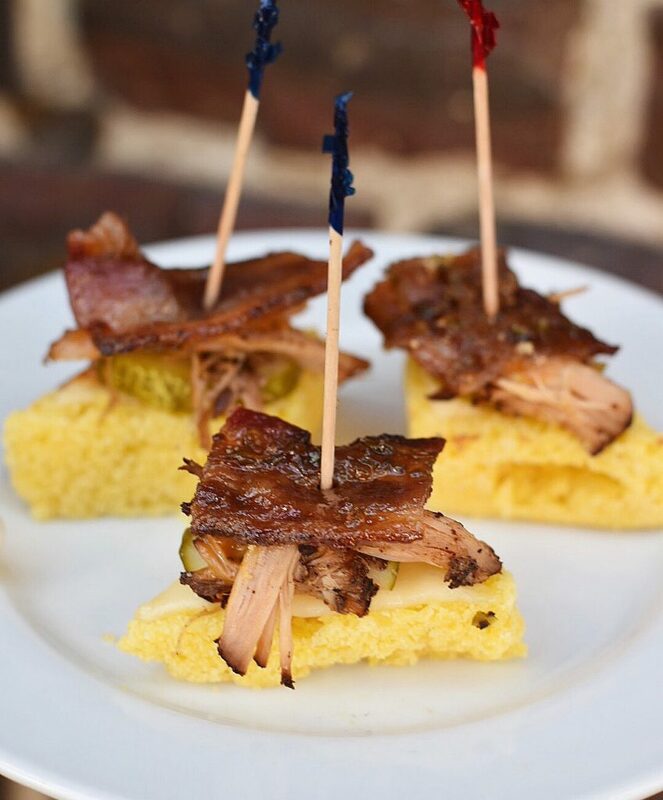 If the candied jalapeño bacon with pulled pork on cornbread dish was any indication, the rest of River City Revival House’s menu should be most excellent. I can’t wait to get back try to their full menu! I always have a great meal at Northern Chicken, our second festival preview stop, so their peameal slider was no exception. When I went to sample their BaconFest YEG dish this week, they also *happened* to have a chocolate and peanut butter blondie with candied bacon as their dessert special of the day. It was a deliciously decadent way to end the bacon-themed preview! 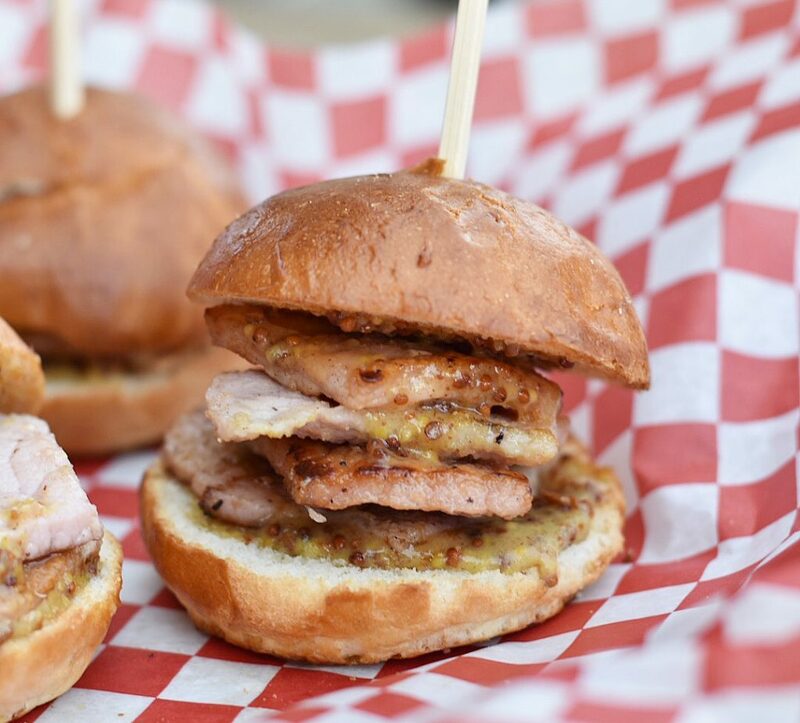 Try the housemade peameal bacon with housemade bacon maple mustard from Northern Chicken at BaconFest YEG! You’re sure to have a fun and filling time at BaconFest YEG! Enter to win one of three pairs of admission tickets to BaconFest YEG on Sept. 2. I’ll pick a winner on my Facebook, Twitter, and Instagram (3 winners total). Leave a comment on my Facebook post—tagging a friend who loves bacon like you! Leave a comment on my Instagram post—tagging a friend who loves bacon like you! You can do one or all three of these things. I’ll be randomly selecting a winner out of all entries received per platform. Enter by Aug. 24 to qualify! Please note: You’ll win admission tickets into the festival but you’ll still need to get your own food samplin’ tickets! Disclaimer: BaconFest YEG hired me to help promote the event through my social media and blog. This was a paid partnership. This has no impact on opinions stated in this post. I love the taste, smell, and well, everything about bacon!! !